The Jekyll Revelation is a strange hybrid of a novel. It constantly flicks between the diaries of novelist Robert Louis Stevenson, and the struggles of a present day environmental scientist tracking coyotes in Topanga Canyon outside of Los Angeles. In the process deep secrets are revealed. The Robert Louis Stevenson story line is told in diary form. It starts with a murder then flashes back to Stevenson’s sojourn with his family in a Swiss health retreat while he writes Treasure Island. Stevenson was seeking (and received according to his diary) radical treatment for a chronic lung condition. The story of Stevenson’s stay at the sanitarium and his bizarre treatment is told in the best tradition of gothic horror. The results provide more than the inspiration for the novel about Jekyll and Hyde which, once published and adapted for the West End stage, draws Stevenson into the Jack the Ripper investigation. The Jekyll Revelation leans heavily on historical record to create a fictional Stevenson. And Robert Masello effectively manages to blur the line between what is likely to be the truth, fictional licence and out and out fantasy. Meanwhile, in the bright sunshine of Topanga Canyon, Rafael Salazar is dealing with bureaucracy, an unrequited crush and a possible meth lab hidden in the Canyon by a local biker gang. In the midst of all this he finds a strange trunk in a dried lake bed which, together with some old clothes, contains Stevenson’s diaries and the secret behind the creation of the novel of Jekyll and Hyde. This is an engaging tale that could stand alone but is made more interesting by the resonances with the past. While the two stories finally come together in a way, they remain, for the most part, fairly separate. This is not a bad thing, both stories are engaging on their own and the juxtaposition between them is stark. And while the connection can only ever be tenuous it does serve to bring them together for two fairly explosive finales. 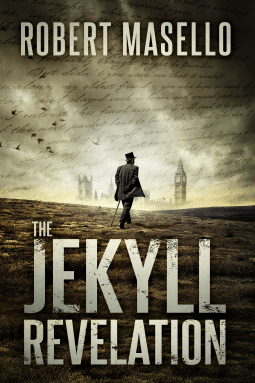 The Jekyll Revelation is a fun reinvention of history with a gothic core. The chilly Swiss Alps and rainy London streets and the drought-stricken Topanga Canyon are well juxtaposed as are the lives of the two protagonists. And proves that, over one hundred years on, the Ripper mystery continues to be a rich source of inspiration for horror and suspense.